February has a bad rap for being the time of year when New Year’s resolutions dwindle and Valentine’s Day chocolate is excessively consumed. But it doesn’t have to be that way – I’m so excited to share a recipe that my kids (and everyone else) absolutely love. 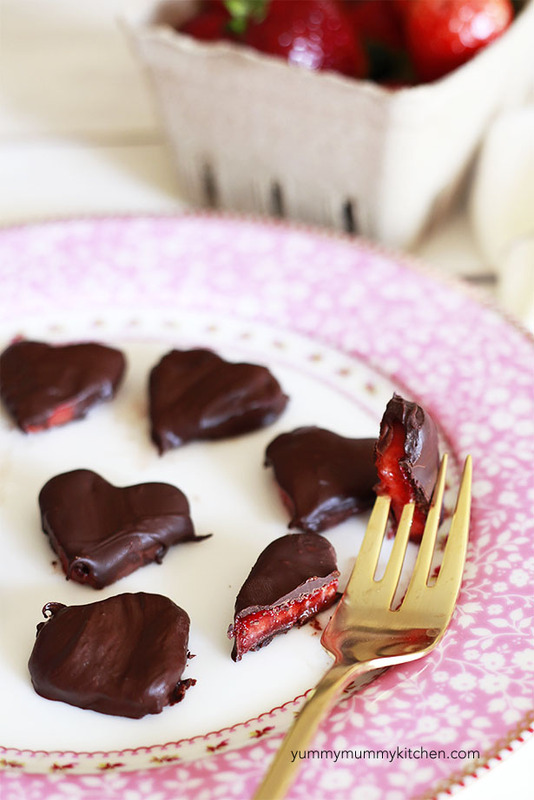 Chocolate Covered Strawberry Hearts seem like such an indulgence, but they are actually guilt-free! Cacao is a superfood – packed with antioxidants and even protein – but turns into something unhealthy when sugar is poured into it. 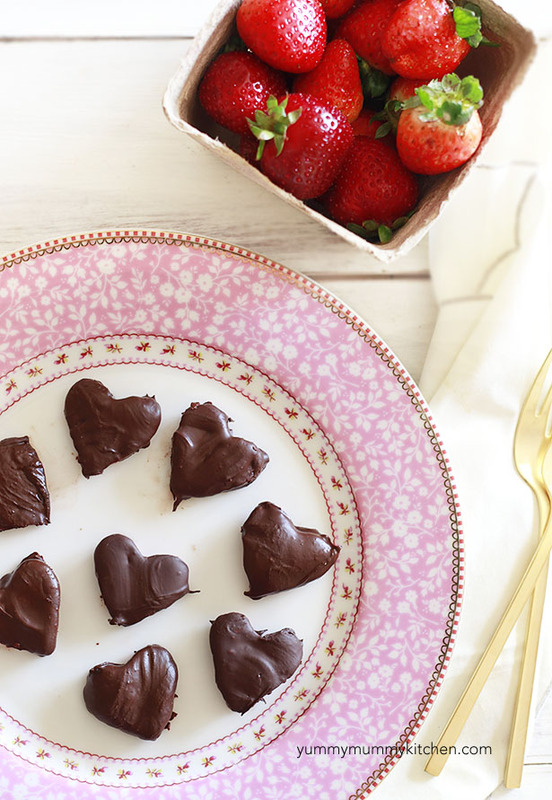 Here’s how to make adorable and healthy chocolate covered strawberry hearts. Start with a package of luscious berries. Larger berries work best here, but if you only have small ones, that’s fine too – I’ll share an alternate method later. Dole is looking to inspire Americans to eat more fruits and veggies in 2015, especially during Heart-Health Month. I love this mission and have teamed up with them here to provide a healthy alternative recipe to keep everyone on track and eating heart-smart! Cut lengthwise slices of strawberry down the widest side of the berries. Use a 1 1/2″ heart shaped cookie cutter to punch out hearts as shown in the photo above. Save the excess strawberry to add to a salad. My preschooler’s favorite salad happens to be baby lettuces with strawberries and sunflower seeds. Melt some stevia-sweetened chocolate chips, or make your own sugar-free chocolate. Dip berries in the chocolate to coat, and refrigerate. These beauties are so healthy you can have as many as you want. Cut lengthwise slices of strawberry down the widest side of the berries. Use a 1 1/2″ heart shaped cookie cutter to punch out heart shaped strawberries. Save the strawberry scraps to add to a salad. Melt stevia-sweetened chocolate chips in a glass bowl at 30-second intervals, stirring between intervals, until just melted. 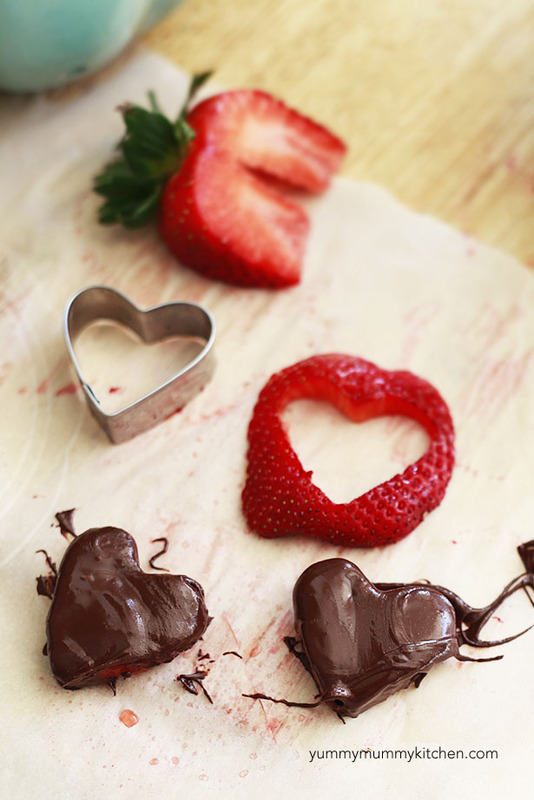 Using a fork, dip hearts into the chocolate to coat. Place on wax paper or parchment paper and refrigerate. If you don’t have stevia-sweetened chocolate chips, you can make your own! In a small bowl, whisk together 1/4 cup melted coconut oil, 9 drops liquid stevia (I use Trader Joe’s), and 2 tablespoons unsweetened cacao powder. This chocolate will be very thin and you will probably need to dip your berries two or three times. The chocolate will thicken as it cools. This post was sponsored by Dole. All opinions, ideas, and recipe are mine. Sponsored posts inspire me with fresh ideas and help cover the expenses of maintaining this blog.